The Internet has taken the world of marketing and branding to a whole new level. There are tremendous ways to attain a top ranking on search engines (primarily Google). Guest blogging is considered as one of the most powerful and beneficial ways to fulfill this purpose. Although a majority people find it a bit difficult due to certain limitations from the website owners, but it is simply a marvelous way to spread the word. I started my company five years ago. It was a time when I was not much literate about internet marketing and I always looked for reliable assistance. Then I came to know about guest blogging and started revealing more facts and benefits it offers. I wrote my first guest blog after a period of almost a year since I started off the company. But, I was literally amazed by the results I received. It worked as an amazing incubator of bringing relevant and healthy traffic to my website. It also helped me to strengthen the online existence in a short span of time. 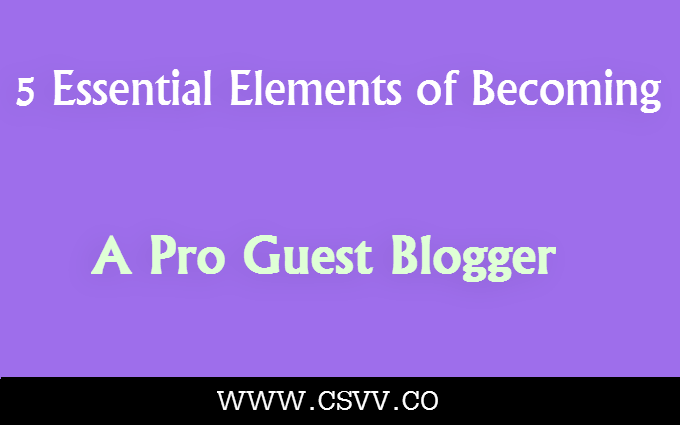 It is due to the reason I am so much eager to discuss five essential elements that are enough to make you a pro guest blogger in no time. Knowing your audience is extremely important if you have a desire to rank high on Google. Before plotting a plan, you should aim to make it effective and result-oriented. It can be possible if you understand the demands, likes and dislikes of your site’s visitors. For instance, if you are targeting fashion freaks who love to read the latest and upcoming fashion trends, you have to look for ways to quench their thirst. A majority of writers don’t prefer doing enough research about their audiences, and this is what ultimately stops them from accomplishing their goals. Going after each and every website is not a good idea to bring incredible traffic towards your site. Instead, you should reach out the best sites that have impressive ranking and domain authority. If the site is renowned, it will ultimately help you boost the number of visitors. In fact, you will also get noticed by the influencers. I have seen site owners who usually target average websites for guest posting. Honestly, these are the sites which will accept your requests at the first go, but can’t promise a healthy return. Once you are done preparing the list of top guest blogging websites, it is the right time to get ready for sending emails. Before creating an email, you need to keep a few crucial points in mind that will surely help you convince the editor of a site. It all starts with a title. Yes, you can’t let your email get marked as spam, but it can be if you are not writing appealing and catchy titles. The moment you create titles, think of some actionable phrases that can compel a reader to open your email. The second most important thing to consider is the ‘email line’. Make your email address as simple and professional as you can. People who are using IDs like [email protected] have fewer chances to get noticed. In fact, they have more chances to be marked as spam. So, be careful when sending an email because it is the key to precede further conversation. Every website follows a certain writing style. If you are about to write a guest post for any site, checking the writing style and format its contributors usually follow is important. A majority of guest posts get rejected just because of this single reason, even after having a productive chat with the owner. Being a professional writer, you have to be well aware of different writing patterns. Especially, when you are publishing an article on some famous sites, you should do a proper research to match the level. Before sending an email to the editorial department, you should write a perfect piece of article to make sure that you are willing and eager to be the contributor. Chief Editors and coordinators consider writers who can provide content without delays. And, it will be a plus point if you complete the article even before starting a communication with the respective person. Sometimes, you will have to make a few changes within the content to meet the requirements. In this situation, you won’t get pissed off and you won’t consume too much time to edit your content as well. It usually happens with many writers that they often get distracted with continued rejections. But, if you strategize everything properly, you won’t find it a daunting task. Eileen Burton is a media and advertising consultant with years of leadership experience. She currently works for a UK-based company offering help with university assignments done by experts. When not consulting, she loves to immerse in her favorite activity, i.e., blogging on leadership and entrepreneur topics.